Hi! How is everyone? I’m doing great! I can’t believe October is coming to a close. It feels like it went by so fast! The cold and rainy weather is definitely here. But it’s perfect crafting weather! So today I have for you my Design Team card for Cricut Cardz Challenge #48! This weeks challenge is to make a card for Thanksgiving using the card feature. You can use any cartridge and colors you like. Super easy and fun! I hope you join us this week. 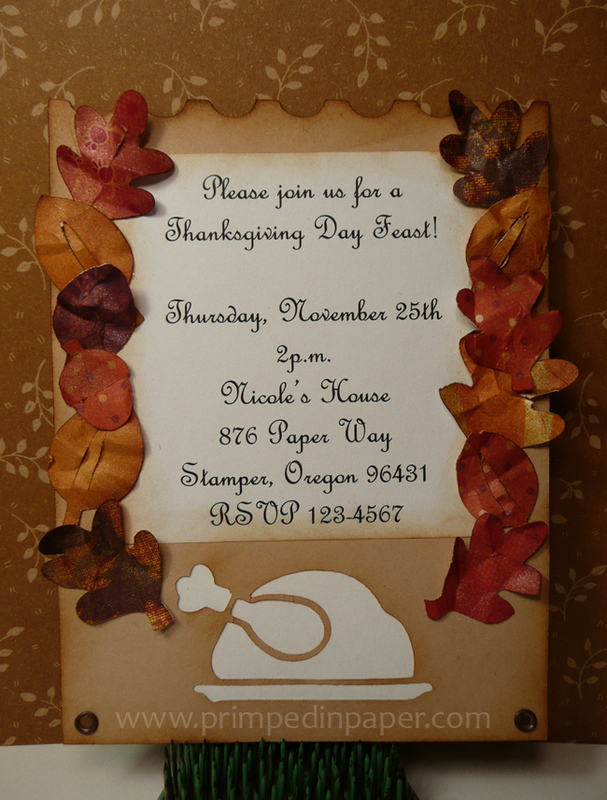 I decided to make a Thanksgiving Dinner invitation using the Doodlecharms cartridge and paper from DCWV Indian Summer Fall Stack. (Which wasn’t a hard choice since out of all the carts I own this is the only cart with the card feature. Lol.) I used my new Gypsy to design this card so I was able to hide some of the cut lines on the leaves. This is a flat postcard style card that measures 4.25 x 5.50. First I inked the card base, printed wording and the leaves with distress inks in Tea Dye and Vintage Photo. 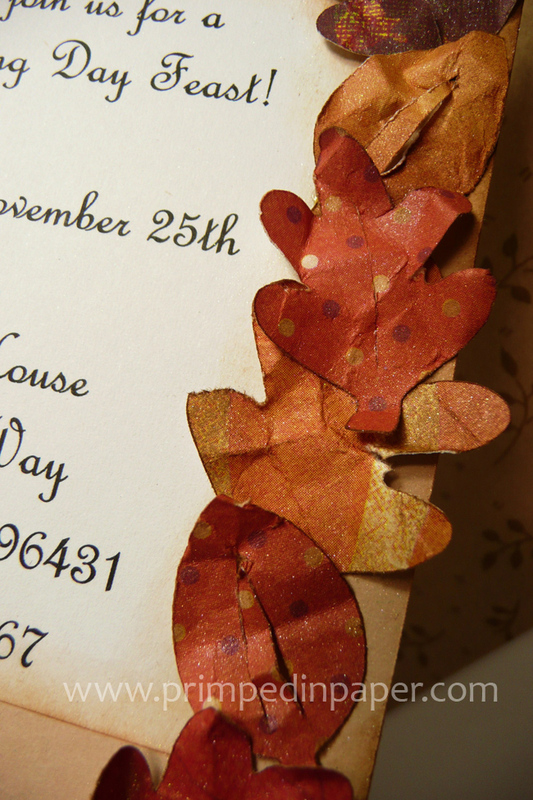 Then I attached the printed wording to my invite. Next I crumpled the leaves, attached them to my card base and dusted perfect pearls in perfect pearl and gold onto them. The wording was typed on my computer and printed using French Script MT font at 22 point. To finish the card I used two brown eyelets at the bottom. If you’re hosting Thanksgiving dinner this year maybe this will inspire your invitations or perhaps it will inspire you to make a Fall card. I hope you like my invitation. Have a wonderful week and Happy Halloween!!! A light dusting of Perfect Pearls gives the leaves a pretty shimmer. Closeup of turkey cut out and eyelets.